First thing which you can do is to make TV a hard to use thing. For this, you can take TV out of your kids’ room or place it in store room to get rid of it. Emphasize on watching family TV together and place that TV in an armoire having doors with it so that you can lock the doors after watching TV. If you don’t have an armoire in your home, take remote control and simply hide it from your kids. Do not let your kids watch TV alone because your kids are not able to make a wise viewing decision alone. 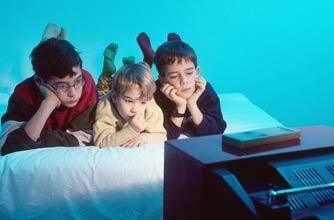 Watch TV with your kids to make sure that they are watching only those programs which are appropriate for their ages. Limit the time of watching TV to maximum of two or three hours a day. This does not mean at all that you are ought to allow those two hours daily. You can create some activities for your kids so that they agree on watching TV even less than those two hours. It is even better to limit watching TV to weekends because it is easier to handle weekend TV viewing. Kids always imitate what their parents do so try to be a good example for your kids and watch less TV. For this, you will need to show them that you don’t need a TV to have fun and enjoy. Make them understand that there are a lot more activities which they can do to relax. If your kids want to watch shows which are inappropriate for their maturity levels then have a conversation with them. Encourage your kids to explain to you why they want to watch that particular show. Then make them understand by explaining why a specific show is not good for their mental level. You can also set some rules for watching TV. For example, if your kid has watched a particular episode of a show more than once, it means it is no longer eligible for viewing as watching more than once is enough. Make a TV schedule to plan viewing time. Help your kids highlighting those shows which they don’t want to miss. Encourage them to use any other color to indicate those shows which they can easily edit from their viewing plan. I think this is the most appropriate technique to help kids breaking bad TV habit. Sun rays are harmful for skin as they can cause blemishes so putting a sun screen is essential to keep the skin protected from harmful rays of sun. We all know this fact but a few of us apply sun screen to keep our skin fresh. If you want a beautiful and glowing skin, don’t forget to apply a good quality sun screen before going into sun. Lack of restful sleep is another bad skin habit as it causes to produce stress hormones. These hormones create dark circles under eyes and make your skin looking dull. Sleep does not only provides beautiful skin but it also help prevent wrinkles. Are you a smoker? If yes then you can never get a fresh skin. Actually smoking decreases flow of oxygen in the skin and speeds up aging process due to which your complexion looks dull and dark. Smoking also causes lines around your mouth making you look ten years older than your actual age. Drinking too much alcohol is also harmful for health and skin as well. Although red wine provides antioxidants which are good for skin, excess of this wine can harm your skin. Alcohol is a cause of dehydration which consequently leads to wrinkles and dryness of skin. Another bad skin habit is to sleep with make up. Sleeping without removing make up is very bad for your skin because it gives rise to clogged pores and breakouts. Too much exfoliation is not good for your skin. Your skin needs exfoliation only once a week. Exfoliation also wipes those oils from skin which are necessary to make the skin glowing. If you are gaining or losing weight too fast then it will also damage your skin because in this case, fibers of your skin get weaker giving rise to premature aging, stretch marks and lines on skin. Don’t compress your pimples because pimples are caused by bacteria and virus and after compressing a pimple, if your hand touches somewhere else on the skin, it will create new and more pimples. It may also cause scars and large pores which make your skin look bad. Using too much salt in food is also a cause of bad skin as salt dehydrates the skin. Similarly, using too much sugar is also harmful because it results in wrinkles on your skin. So try to increase the use of fresh fruits and vegetables in your diet. A well-balanced diet will make your skin beautiful and glowing. Some facial movements and expressions like frowning and laughing, that are repeated again and again, can cause contraction of skin muscles and produce wrinkles. Try to minimize excessive facial expressions. Remember that skin is the most exposed and best part of our body and we must take care of it. Taking care of skin is not difficult at all. If you will simply avoid above mentioned bad skin habits, you will have bright and glowing skin.